My first Omaha Fashion Week event! 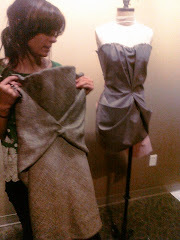 I worked all of spring break fitting models and finishing 2 final garments! Unfortunately, I wasn't present for the event, because I had to get back to school, but I was able to leave marketing expert and bff, Kate Richling, in charge. Thanks to her, everything went smoothly, and I was able to receive picture text updates throughout the day.